Debate over the Vietnam War escalated as did US involvement in the late 1960s. 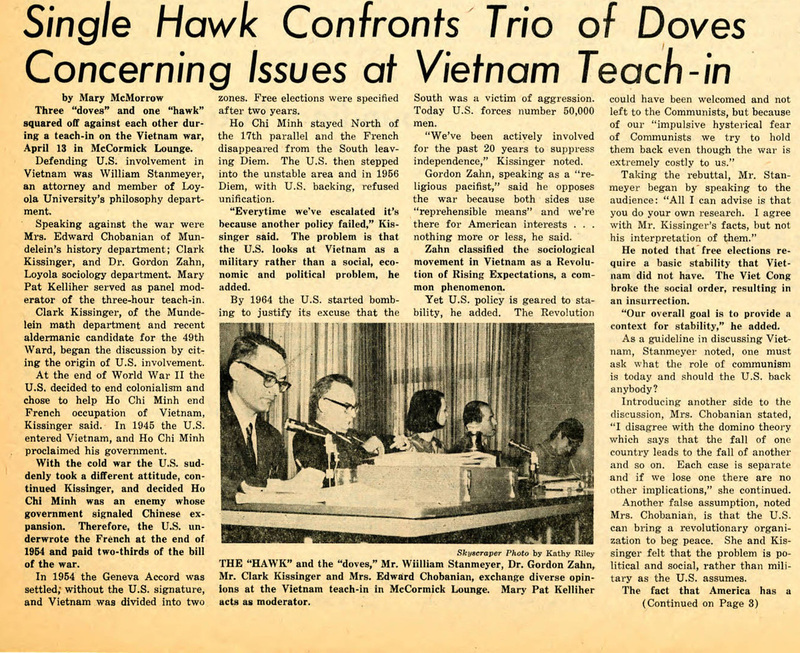 In 1967, classes were temporarily suspended for a Vietnam Day “teach-in” in which guest speakers and Mundelein professors diplomatically debated the pros and cons of foreign policy. No conflict greater divided the Mundelein College student body than the Vietnam War. Whereas student support of United States involvement in World War II never wavered, Mundelein undergraduates continually questioned the country’s role in Vietnam in what became an era of vehement antiwar protest and agitation for change. This section explores the influence of the Vietnam War on Mundelein College in three sections: Mundelein Student Mobilization, A Campus Divided, and Moratorium, 1969.